Holiday season is coming up, and if you are anything like me to take far too much shizz with you, but there is always that fear of going away and not having that one item you forgot to pack. I have recently discovered Mini Moderns a company that was launched in 2006 by London based designers, Keith Stephenson and Mark Hampshire, Mini Moderns is an interiors brand specialising in applied pattern across a range of products including wallpapers, fabrics, cushions, rugs and ceramics. The initial collection was snapped up by Heal's and the brand continues to go from strength to strength, selling online and via selected stockists around the world. 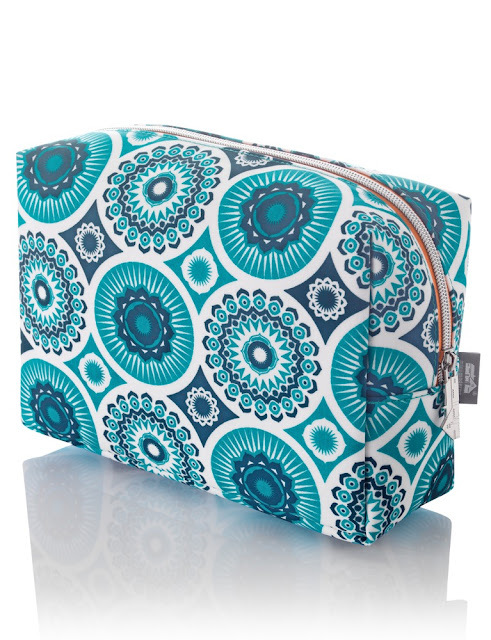 My introduction to the company was by way of a fabulous washbag, which is the perfect size for filling full of products just to ensure I don't miss out on anything on my travels ! The site is a riot of fabulous colour, and my washbag is no exception featuring one of the most colourful and iconic designs Darjeeling. The exotic Darjeeling print is described as ‘a riot of tessellated eastern motifs’ and fuses images of British domesticity with strong Eastern influences. It was debuted as part of the 2013 Mini Moderns Buddha of Suburbia collection, an illustrated homage to Hanif Kureishi’s book of the same name. If you are a lover of modern interiors and bold colourways then the site really is worth a visit.